Drink flat rate Meeting per person, Calculation based on an 8-hour day. Price per hour: 2,00 € Apple juice Fritz Kola Fritz Apfelsaft/Rhabarbersaftschorle Fritz Mate Fritz Orangenlimonade Mineral water (still, sparkling) Warm drink: tea, coffee, including milk and sugar * Every additional hour will be charged. There are 7 tables included in the space. For every additional table the price is 14€ per table. Soundanlage für Veranstaltung: 2x RDV Aktiveboc, 2Boxenstative, Soundcraft Mixer. 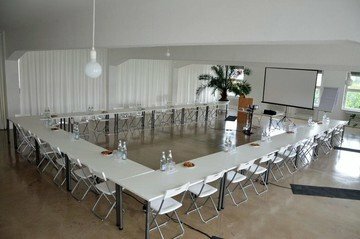 Colonia Nova offers the perfect location for your workshop, meeting and conference. 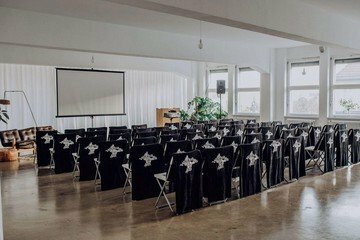 This creative space can be rented for your event in Berlin Neukölln. 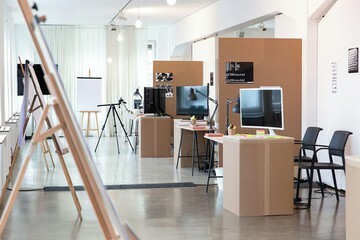 The loft is rented together with its extraordinary rooftop that offers an exclusive view over the rooftops of Neukölln. 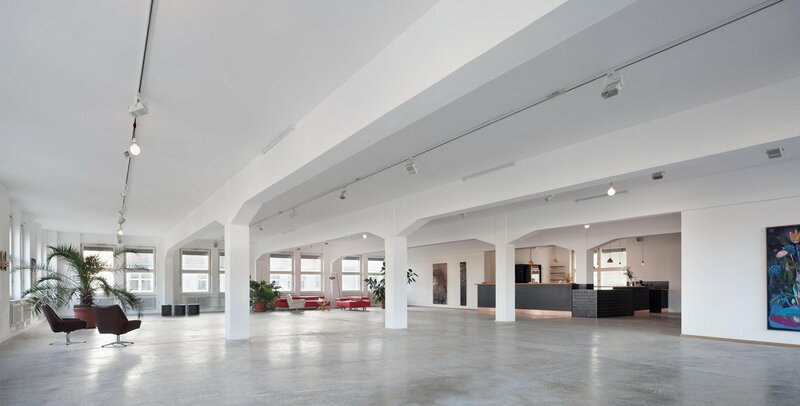 With its 500sqm, the industrially styled loft offers enough space for all sorts of events. 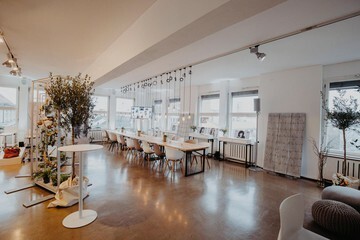 Wether you are planning to host a product presentation, fashion show, conference, showroom or you're looking for a space to host your office party, the loft will suit your style perfectly. Through the use of our curtain system and mobile separating walls, we can create different spaces within our loft. You will also find a 30sqm bar area, custom made from high quality materials, that will give an extra flair to your event. Moreover, the light system with moveable globes and spots, offers a flexible way of illuminating the space. Even the sound system is adjusted to the size of our loft. 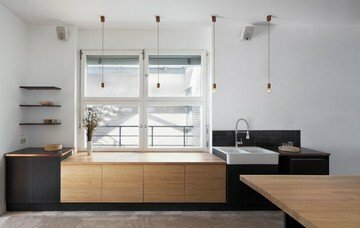 The minimalistic and industrial look of our loft creates an open and welcoming vibe, and still leaves enough space for your own ideas and wishes. 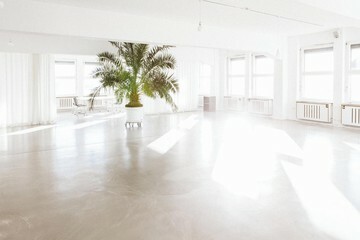 And as mentioned before, the 500sqm rooftop is what makes Colonia Nova one of a kind in Berlin! Colonia Nova has been working together with a trusted catering partner for the past years, and we will gladly introduce you to them over the course of the planning. Drinks will be taken care of by us exclusively. We are happy to provide you with several option for drinks, according to your preferences. We are happy to support you with technical equipment and furniture. Please let us know what you would require and we take care of it personally. Colonia Nova is located in Neukölln, close to the S-Bahn station Sonnenallee. A sprawling 500m2 area, this flexible warehouse space best hired for sizeable workshop events and conferences. Its highlights has to be enormous rooftop terrace and fully-fitted kitchen, allowing on-site catering and refreshments to be served to guests. The venue’s Berlin chic and industrial flavour really make it unique - there a few venues like this in the world.